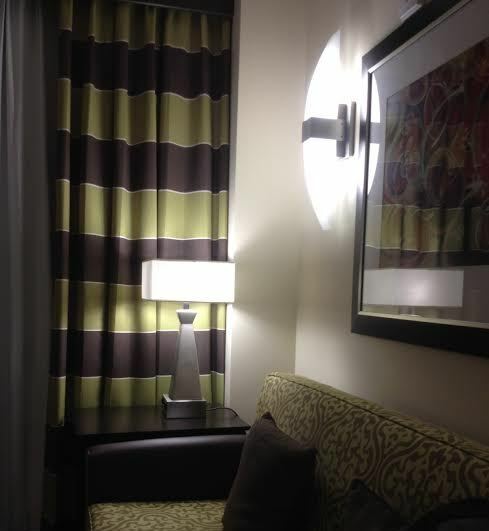 This is a picture of my hotel room at Homewood Suites in downtown Dallas. It’s a nice sized studio type room with a complete kitchen: fridge, dishwasher, microwave, stove range, sink, drawers, and wall cabinets! There’s a small desk, stylish sofa, ottoman coffee table, flat screen TV, king sized bed, and a gorgeous bathroom with a huge shower. Even the carpet is stylish, and the kitchen portion has a hardwood parkay floor. As you can see from the pic, it’s a bit modern. Kind of looks like a picture from a Pottery Barn catalog, doesn’t it? Or maybe a hip nightclub even with its modern abstract art on the walls. It’s fun for a getaway, but certainly not home.